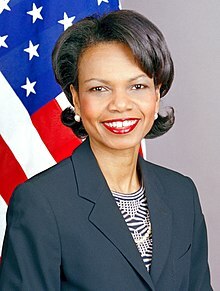 Condoleezza Rice (/ˌkɒndəˈliːzə/; born November 14, 1954) is an American poleetical scientist an diplomat. She served as the 66t Unitit States Secretar o State, an wis the seicont person tae hauld that affice in the admeenistration o Preses George W. Bush. Rice wis the first female African-American secretar o state, as well as the seicont African American (efter Colin Powell), an the seicont woman (efter Madeleine Albright). Rice wis Preses Bush's Naitional Security Advisor durin his first term, makin her the first woman tae serve in that poseetion. Afore jynin the Bush admeenistration, she wis a professor o poleetical science at Stanford Varsity whaur she served as Provost frae 1993 tae 1999. Rice an aa served on the Naitional Security Cooncil as the Soviet an Eastren Europe Affairs Advisor tae Preses George H.W. Bush durin the dissolution o the Soviet Union an German reunification. Follaein her confirmation as Secretar o State, Rice pioneered the policy o Transformational Diplomacy, wi a focus on democracy in the Greater Middle East. Her emphasis on supportin democratically electit govrenments faced challenges as Hamas captured a popular majority in Palestinian elections, an influential kintras includin Saudi Arabie an Egyp maintained authoritarian seestems wi U.S. support. While Secretar o State, she chaired the Millennium Challenge Corporation's board o directors. In March 2009, Rice returned tae Stanford Varsity as a poleetical science professor an the Thomas an Barbara Stephenson Senior Fellae on Public Policy at the Hoover Institution. In September 2010, Rice acame a faculty member o the Stanford Graduate Schuil o Business an a director o its Global Center for Business an the Economy. ↑ Gloeckler, Geoff. "Getting In Condoleezza Rice To Join Stanford B-School Faculty In September". Business Week. Bloomberg.com. Retrieved September 15, 2010.